Knuckles the Echidna 8 is the eighth issue of the Knuckles the Echidna comic. This comic features one story: "The Gauntlet", the second part of the Dark Vengeance arc. Spun away from Mobius in his own tornado by Enerjak, Knuckles realizes just how many events have occurred in his recent history since he gained more friends, acquaintances and his family. Unfortunately, with all these new friends, he also gained a number of enemies; most notably the powerful Enerjak. His little tornado arrives above one of the moons of Mobius, where Knuckles notices Enerjak contemplating what to do. He talks to Knuckles, telling him he is going to break the echidna down, completely, to pay for what he had done to him before. Knuckles, however, reverses that last sentiment at Enerjak, angering him. He tells Knuckles that he could never comprehend the power he controls, the power to send him from the Floating Island to the moon, while entrapped in an air pocket for survival. This doesn't put Knuckles down, as he recalls that their previous fight showed that Enerjak was weak while fighting, and that he lost overall when he was shot into space. Enerjak gets even more enraged, taking Knuckles and transporting him back to Mobius...into the ocean. This time, Enerjak has not given Knuckles an air pocket, as he struggles to keep control while the powerful echidna laughs at the power he holds. At the Dark Legion compound, a Dark Legion member fills a cup of water and hands it over to Kragok, who is speaking to Julie-Su. Not wanting to abandon his kind, he sips on his water and enquires into her actions, but is also concerned that she was exposed to radical ideas in her time with Knuckles. She fibs that it was a chance encounter and that both fought more often than working together. She claims she was using Knuckles to return to the Legion, especially ever since she received word that Dimitri had returned. Despite the risks, Kragok accepts her back into the Legion, though tells her that she better keep her word. Julie-Su exits the tent and walks along a road witnessing her comrades working on their vehicles, though, despite being back home, she still feels like a stranger. She eventually meets up with her commanding officer, Sergeant Rykor, who is ordering his men to get their vehicles ready to move-out at a moment's notice. She walks up to Rykor, asking him to resume her position under his command. Pointing his baton in her face, he tells her she can, but warns her that if she ever causes his loyalty in her to falter, she'll be done with. She pushes the baton away, telling him that she has work to do. In Echidnapolis, Lara-Le arrives at Constable Remington's office, surprising the constable. He helps her sit down at his desk as she asks for a favor. Serving the guardian and his family, he is more than obliged to do so. He takes his own seat as Lara-Le asks the constable to get her in contact with Locke, since she believes he is the only link to him. He is very reluctant to do so, but Lara-Le further goes on to state that it is about a father and his son, urging him to break protocol just once. Remington contemplates what he was told in the past by his predecessor, Holmes, who told him to not get personally involved in the guardians' issues and to respect their privacy. If he was to do what she asked, he would be breaking that idea. Leaving her with a long silence, Lara-Le asks him again for help. Knuckles has a problem as well, still underwater. He swims for the surface, away from the laughing Enerjak, hoping he can get to the top in time before he runs out of air. He passes a school of fish, then noticing a shark heading right for him. Despite his chest feeling like it is going to explode from the pressure, he stops his motion and floats perfectly still, making the shark passing him thinking he's part of the landscape. With the coast clear, he continues swimming for the surface, as his head starts to go woozy due to the lack of air. Right before he reaches the top, a large tentacle grabs his legs, stopping his motion. As he's pulled down by the creature, an image of Enerjak appears, who is enjoying Knuckles' struggle...while a one-eyed large octopus pulls Knuckles toward its mouth. In his sickbay, Locke recovers from his telepathic link with Hawking, greeted by his father. He gets up, his head hurting from the experience, as his father tells him that Hawking is still in a coma, but alive. Before Locke can describe what happened in Hawking's mind, an alarm goes off, fully awakening the echidna. They both leave the sickbay for the command room to determine what is going on. Once they arrive, they look at the monitors showing the Dark Legion's activity, and, most notably, Julie-Su's return to them, working on maintaining their vehicles. Noticing that the Dark Legion is preparing for a strike, and that Knuckles is nowhere to be found, the two echidnas believe that Echidnapolis is targeted for an attack. Locke decides that, for once, desperate measures should be implemented. Knuckles, on the other hand, continues to be pulled toward the maw of the octopus. Once he gets close enough to its body, he uses his fists to punch the octopus' head, injuring it and allowing him to escape. With time running out, he swims as fast as he can to get to the top. Just before he runs out of air, he arrives at the surface, taking a huge breath of air in. However, his joy for getting to the surface is cut short as he sees Enerjak floating above him, telling him that his only hope is to bow down, kiss his feet, and to beg for mercy. Knuckles, of course, doesn't accept this, thus makes Enerjak conclude that his breaking point hasn't been reached yet. Back at the Dark Legion compound, the Chaotix, captured and tied down beside a tank, notice Julie-Su's defection. Vector instantly concludes that she has, and always will be, a bad guy, but Mighty, being a cool-head, believes there is more to the story than what they are witnessing. All their talking attracts the attention of a guard, who arrives to tell them to be quiet. Vector, during their conversation, breaks free of his ropes and attacks the member, grabbing his gun and hitting him over the head with it. Now free, Vector goes to help his friends, but is stopped as he sees Julie-Su aiming a gun at them. She fires a gas at them, knocking all three out. Kragok, witnessing all of this, claps and congratulates Julie-Su for her work; however, he has one more task for her...to finish them off. To break Knuckles, Enerjak transports both of them 30,000 meters above the Floating Island into the freezing cold atmosphere. Knuckles, though shivering from the cold, jokes that it is quite soothing and that he should visit more often. Rather than Knuckles breaking, Enerjak himself breaks from the frustration, sending Knuckles on a free-fall for the island. He plummets faster and faster toward the surface, though maintains his cool, knowing there is some way to get out of this situation. On the other hand, Archimedes and Deo Volente, stuck in a glass orb held by Kragok, can't figure out a way to get out of their situation. Although they can't believe the power of Dimitri, they know that they can outwit the Dark Legion. Kragok, with the glass orb holding the ants, walks into the Sandopolis Zone of the Floating Island with some Dark Legion members and Julie-Su. He puts the orb into a cooler-like box, pressing a button on it to activate an electromagnetic field. They then throw the box into the sand and bury it deep. 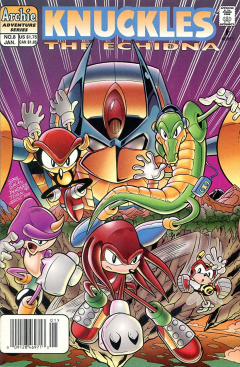 They walk back to their camp, as Kragok declares that, with the ants, Knuckles and the Chaotix out of the way, their operation to capture Echidnapolis can begin. The ants have no way to escape, with the electromagnetic field preventing them from transporting, leaving them in their toughest situation to date. Knuckles continues to plummet for the ground. He gets closer and closer, about to hit a rock face, but, at the last second, he is stopped by Enerjak, who gives him one last chance to succumb. Still keeping his cool, Knuckles sticks his tongue out at him, pushing Enerjak to the end of his rope. Knowing he can't break Knuckles' mind, he decides to break him apart...literally. Using his powers, he starts to disintegrate Knuckles, cell-by-cell. A flag of Mobius is visible on the Mobian moon. This page was last edited on 14 March 2015, at 06:40.